I LOVE having painted nails. On the hands I think they make all rings and accessories look better, and on the feet they DEFINITELY make sandals look cuter. However, I hate painting my nails. I'm not great at it, my cuticles are always dry, and things just chip too fast. That is until I found these lovely two formulas below. I've always loved Essie polishes for the color selection and ease of application, however they don't have the best lasting power. They usually chip in 3-4 days for me, which can be annoying as I end up picking at them for a few more days until I can't take it anymore and take it off. 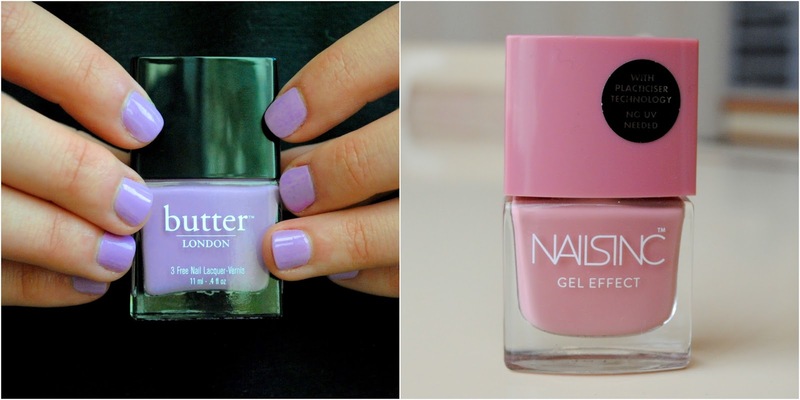 A while ago while taking a look around Boots, I decided to pick up two nail polishes from brands I hadn't tried before: Butter London and Nails Inc.
For Butter London I got the shade Molly Coddled (£12.00), which is a beautiful light purple. This is definitely my favorite shade to wear on the nails, and I can never get enough of it. I'm for sure guilty of having too many a similar kind. I found the wear on this great as it didn't chip until around the 6th day (and very little too, on the corners of my thumb/index finger), and it was fine on my toes until I took it off. From Nails Inc. I got the shade Uptown (£15.00) in the Gel Effect Formula. This is probably my favorite subtle nudey-pink shade from the polishes I own, and opted to wear this for my graduation. It was very hard to photograph on my nails though as it just looked off in every picture, so you have to just trust me. I took it off after 7 or 8 days and there was not one chip, scratch, or problem in it at all. This has definitely made it's way up to my favorite formula ever. That being said, there aren't THAT many colors in the range, and one polish is quite expensive. I have already purchased two more for myself and one for a friend, though, so..oops? What are some of your favorite polishes and formulas? I'd love to know.